When a ballerina encounters an aerial circus artist, what do they tell each other? Stories of virtuosity, preparation, brio, point shoes, elevation, pirouettes, arabesques, suspension, of flying, maybe… But when a ballerina encounters an aerial circus artist in a voluntarily limited space? When the ballerina and the circus artist wander from one space to another as one? 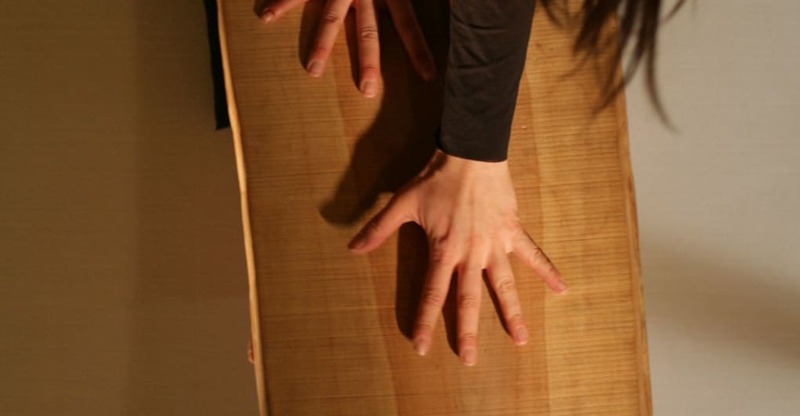 Les Absents has known several versions, as it adapts to non-theatrical spaces. It is clear that space always has an influence on form. However here, form secretes its own space, before flowing into the mold offered by circumstances. Because Les Absents imposes its changing form, with its modular contours. “They” dictate their law, soft and imperative. A law to be heard, perceived, felt, like a little internal music, in an open relationship to space. For the “invited” as well, the experience differs depending on whether the restricted space is a container, a small director’s office, or a mysterious theater basement. At times as bats in the belfry, at times as a dark and surrealist Ophelia floating on her back, the hybrid being transmits an undulatory movement, almost continually, in aerial swimming—a pulsation? Very short and almost imperceptible breaths and pauses indicate a dialogue, and mutual listening between the ballerina and the circus artist, not their fusion, nor their power games. In this way, they exchange their universes, their roles and their visions of the world; they permeate each other, unite their mutual absent ones, who become ours, as the space thus animated gently adopts us. It allows space for all the absent, to each his own, and to those present at the back, on the small benches, caught up in a peaceful movement of images and sensations. The container, where does it come from? This formatted, standardized vacuum, it alone allowed to cross borders nearly unhindered, far from encouraging isolation and withdrawal, does it not in effect indicate free exchange, diverted from its stubborn and destructive meaning? Indeed, who says the container doesn’t travel during the adventure? One thing is certain: at the end, we have not returned to the same place, and we have accomplished one revolution around an invisible and essential center, within ourselves and in space. In a container, a director’s office or a mysterious basement, through their intimate alliance, a ballerina and a circus artist take the risk of probing certain secrets of the living. With support from the Conseil Général de l’Essonne.